I’ve read this before and it was so inspiring. I’m so interested in Anne Frank and buy and read every book I can find about her, also I have a DVD. I really feel as if I know her. This is a great book and recomend it and give it a 10 out of 10. This is not a book, it’s a DIARY! And I love it and to be honest, while I am reading this book I feel a little bit guilty for reading someone else’s diary. And if you found it boring, well, what do you expect? She’s been stuck in the Annexe for nearly 3 years. Anne Frank’s narrative is amazing and inspirational. At the start it was boring but when they go into hiding its really good. Anne is so inspiring, even so long after her death. Her amazing writing skill despite her young age and her honest exploration of herself and love makes her diary fantastic to read. It gives a lot of background knowledge to the reader about the real-life scenarios during the second world war and is a must read for every single person. This is the autobiography of a 13 year old girl who goes into hiding when the Nazis threaten, persecute and murder Jews like herself. The story is particulary touching and sad because you know it is all real and that Anne Frank and her family really did go through all of that suffering. I was hoping there would be a happy ending. Read it to find out if there is! Loved this book! Inspired me! 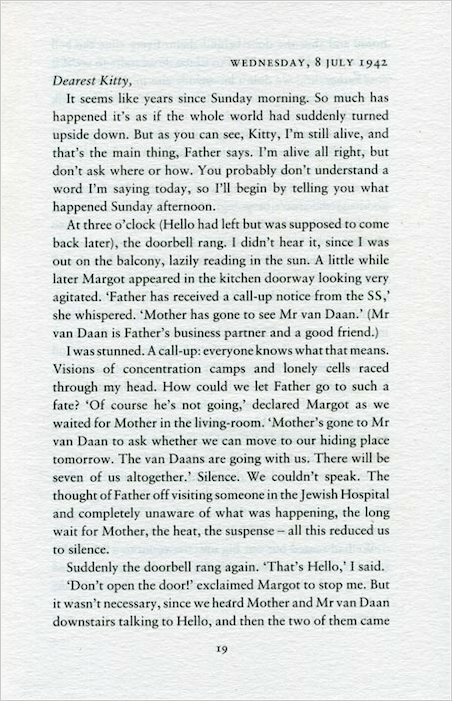 Anne Frank’s story is amazing. i have read this book and it is truley amazing its very emotional. Such a detailed account of what really happened. A great diary that has lasted for a long time – hopefully it’ll last for a lot more. I’m really enjoing this book, full of humor,adventure and even romance(Peter) jaja. This is one of the books that everyone must read. It is important to know about what happened to people like Anne Frank. I’am reading this at the moment and I’am loving it. I love the way she writes her diary and I feel like I’m in her shoes. Beautiful!! Very trueful I see. I read this book as part of a school project and loved it. Anne is very inspiring and she is so patient when she is having to be quiet and hidden. She meets lots of very interesting and strange characters and you see them through her eyes. She is the kind of person I would love to have met! 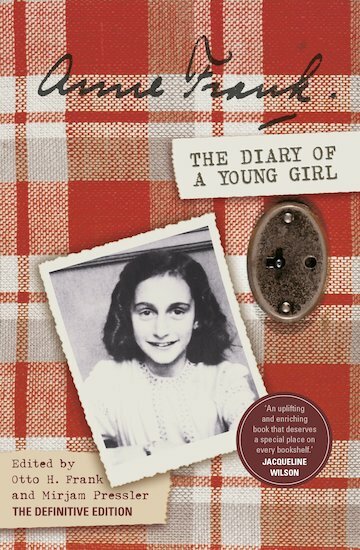 Anne Frank: The Diary of a Young Girl is a moving true life story about a girl who is hiding from the Nazis. I found it was really good, even though I was expecting it to be boring. I finished it in 2 days!!! I liked this book,it drew me in from the first page. By the end of the book it felt like i really knew Anne Frank and it made me feel quite upset at all she endured in her short life. This Book/Diary is A-M-A-Z-I-N-G! It tells about how life was for Jewish people, it touches your heart. I am reading this book/diary for my project. this book is amazing. It tells you about a teenage girl in ww2. the girl keeps a diary that she got for her birthday.as she grows up she sees the changes. after they started taking people to the concentration camps they decided to hide in a secret annex. there were 7 people (with anne’s family-margot,mother.father. this book is great a lovely book but a bit sad. this book is amazing however i would recommend it to 11+ years old. I loved it. I sepiley love pages 19 to 20. I just bought this book today! It looks so intresting, I’ve been wanting to read this for such a long time about five years! Finally I have it, I can’t wait to start it. I shall be reading all through the night! Eeeep I’m so exciting to read it :D I have it right beside me now, it’s such a beautiful sight.. After reading all the reviews I’m even more excited about reading it, YAYAYAYAYAYAYAYAYY! I know I will love it and treasure it forever and ever. It’s a very moving book! I can’t belive how mean some people could be back then. This is a sad book that made me think and feel about peoples feelings. i love anne frank this book is very moving it realy shows what life was like int he war! i read this book one evening and the way she written the words made me feel as though i was with her.very touching. It was ok but a bit boring it was really intresting to find out what it was like to be Jewish during the war. An amazing book which should definitely be read! Along with being educational it can show you a lot about life as a teenager! Would be especially good for older girls to read. I have read her diary. It is very very good. I love Anne Frank!! It is very moving but very good . I love it lots . I think its a great story personly.BUY IT! Its so sad but interesting. i love finding out about all the things that happened in the war. its a very touching book and i would rate it 4/5. This book is very emotional. There is love between Peter and Anne; the boredom and frustration of beeing shut up in a small space with 7 others and the horrible fear of being caught. Her diary makes you feel lucky and you can’t even begin to imagine living the way she did. It is interesting to read about Anne’s thoughts whilst she is hidden away from the world. i sooooooooooooo want to read this book ! 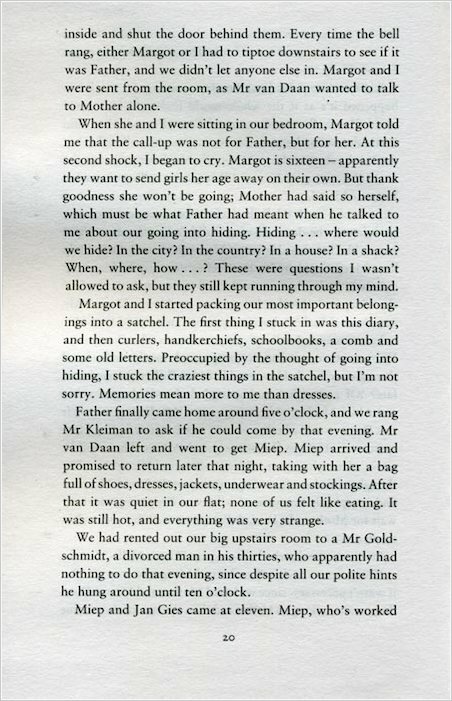 The Diary of Anne Frank is a tremendous book. Anne writes about her wartime experiences as they happen. 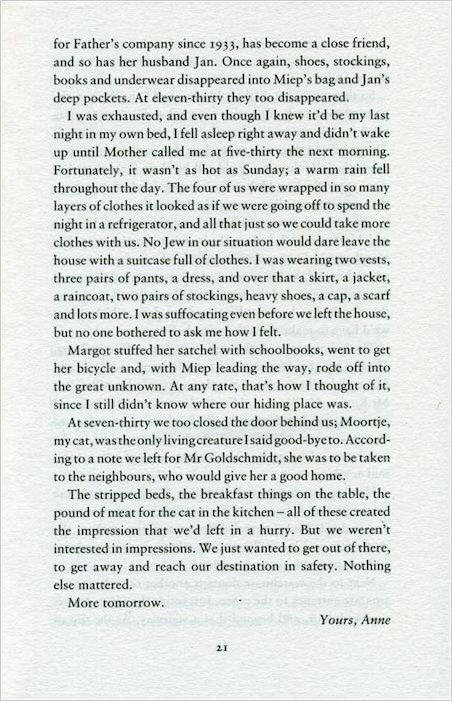 A marvellous piece of writing. If I had the chance, I would give it 4.5/5, however because it is either 4/5 or 5/5, I must go for 5/5! This book is just remarkable! that is why reading is my fave hobby! Very moving story. It really gives you a taste of what it was like for people in the war. Very sad ending which really gets you but a great read which is also educational. I have not read this but really , really want to. i heard about it in jacky wilson’s book secrets.